Its 0.05p for 75 room and 0.10p for 90 room. There is an expression “on cloud 9” and it means feeling pretty darn good. And it would best describe how you may feel when playing at Bingo 9. They will have you so mesmerized you may never have your head out of the clouds. The weatherman reports unusual cloud activity high up in the sky with a shiny blue number 9 bingo ball floating on a white billowy cloud. For the bingo lover there is nothing unusual about it. Bingo 9 is taking the online bingo community by storm and it’s not storm clouds, rather an exceptional gaming portal. 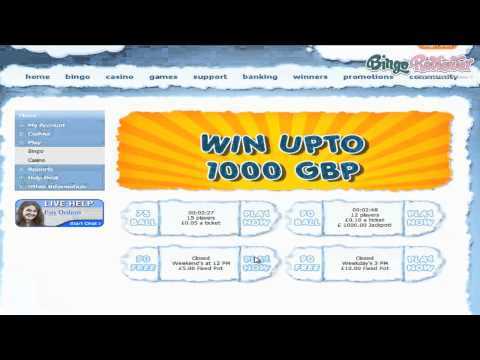 A YouTube Video of Bingo 9 is located on the homepage and very informative as it boasts awesome promotional offers. The testimonials from players about their winning experiences are inspiring. Play n Go software is the essential component that gives Bingo 9 a platform for a powerful gaming package. The Swedish software employs executives with over 10 years experience in the online gaming industry. All games are subject to the laws and regulations of the United Kingdom. The hardest part about playing at bingo at Bingo 9 is deciding which whether or not to play 75 ball or 90 ball bingo first. They are the two big favorites among bingo fans. Bingo rooms start at .05 per ticket and feature Jackpot games and Fixed Pot games. There are 5 bingo rooms with 2-3 open at one time. Free Bingo is available weekdays and weekends at certain times only with free tickets for cash prizes. The Auto Buy feature allows players to automatically purchase tickets with an activate/deactivate option and is available in each bingo room. If a player’s bingo game is disrupted the games will continue to play out and any winnings credited to account. There are 13 Slot machines to choose from and 8 Video Poker selections. Blackjack offers a variation with multi-hand games included. Roulette and Scratch Cards complete the game selection. A Signup Bonus with free cash and a Welcome Bonus on your first deposit is available to all new players. Reload Bonuses on all other deposits with extra bonuses offered from time to time. Follow Bingo 9 Twitter and like them on Face book. Post your nickname on Face book and receive £5 free cash. Participate in Chat Games and you could win an extra £5 Dosh. Refer your friends to Bingo 9 and be rewarded with a sweet cash bonus for every successful referral. The competition is crazy with promotions that offer top active players, top wagers and max tickets for a share of a cash prize pool. Spin the slots and be one of the top 3 players on selected games and win a cash prize. Monthly specials are also available and can be found under the Cloud 9 tab under Promotions. The competitive incentives are ideal for players who like a challenge. Cash prizes are an appealing feature. We rate Bingo 9 with 4 Pink Hearts. You can choose from lots of different free bingo rooms here. They all take place on different days and different times so you’re never short an opportunity to play. They also feature must-win jackpots where you can earn up to 1000 GBP. They even have penny rooms, and I absolutely love when sites offer penny rooms. That means, even when I don’t play for free, I at least don’t have to play for much. And the prizes aren’t half bad at all! I’m more a fan of 75 ball so I tend to stick to that more often than not. They also have some great slots too. I usually go for bell of fortune when I do slots and have some pretty good luck when I play it! They also run a special promotion where they select a player of the month which can be pretty exciting. I have yet to win but it certainly keeps things interesting. This is a great UK site for bingo lovers, and specially those who like the freebies. There are 12 rooms in total! Probably the best offer I have seen so far, at least for the number of rooms. A lot of those rooms have free games to offer, and all you need to do is check the schedule to get the best out of it. What I didn't quite like is that all you get are the 75 and 90 ball games, rather classic and games you can find everywhere. A nice jackpot is there too, and that is something to look forward to. The promotions are good, but nothing too special, but at least there is a 10 pound free Trial, for new players, so you can check the games and the site before you decide to make a deposit and stay. A really nice place I will keep bookmarked. I found this site to be pretty average. I hope this doesn’t come off badly because it’s not really a horrible site or anything like that; it just didn’t do much for me. For their bingo, they only really offer the basics. You can find 75 and 90 ball here which is pretty standard for any bingo site. It’s always nice to see maybe 30 or even 80 ball in the mix. The one thing I did like about this site, however, was the free bingo available. That’s one thing I can’t knock them for. They have plenty of free bingo rooms available. All you have to do is click on their ‘bingo’ page and you’ll see a long list to choose from. Other than this, I didn’t see anything too unique about this site. I just wish they had a little bit more going on that made what they had to offer a bit more different. 75 and 90 ball bingo rooms!